I hate to start my review this way, but I feel it’s necessary: I’m aware of the controversy surrounding Ramona Blue that started when the original synopsis was revealed. While I understand why people would be upset and offended over the idea of a lesbian ‘magically being turned straight when she meets the right boy’, that’s not what this book is. Ramona is SEVENTEEN. She’s young and doesn’t have a ton of experience. She thinks she’s a lesbian because she’s only ever liked girls. BUT people are allowed to feel how they feel, like who they like, and choose how to label themselves - and people have the right to change those labels. Or not choose a label at all. EVERY queer experience is valid and deserves to be told, and I think how Julie Murphy chose to tell Ramona’s story was pretty damn perfect. She took potentially loaded subject matter and handled it with thoughtful, insightful care and respect. As a YA book this book is meant for teens - they are its target audience. I can’t tell you for sure what I would have thought of this book at 17, but I’m pretty sure I would have appreciated Ramona’s honesty, bravery, and wisdom, especially as someone who was exploring and discovering her own sexual identity at the time. This book is about so much more than a girl who thinks she’s a lesbian and realizes the world is more than just black and white and that feelings change, people change, and circumstances change. This book is going to resonate with so many readers, and be NEEDED by so many readers. I would never want to invalidate anyone’s feelings or concerns, but I wanted to share my perspective and opinion on this as someone who has actually read the book, since the majority of pre-release reviews and 1-star ratings are from people who only read the synopsis. Now, with that out of the way, let’s get on to the actual review, shall we? I read and enjoyed Murphy’s first two novels, Side Effects May Vary and Dumplin’ and was eager to read Ramona Blue. I didn’t really know what to expect, but I know I didn’t expect to be blown away the way I was. I loved this book so much. 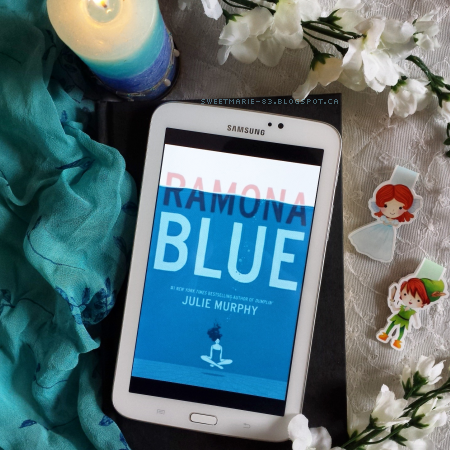 Featuring a complex main character, a fantastic and diverse cast of side characters, and strong emphasis on family relationships, self-discovery, and love in its many forms, Ramona Blue encompassed all my favourite aspects of YA. Ramona’s self-discovery in this book was a thing of beauty. She was a complex character to begin with, but her growth and the things she learned - about herself, about love, about life and family and so many other things - was incredibly poignant. I connected with her easily, and rooted for her from beginning to end. This book was so much more than a story about Ramona being sure she was a lesbian and then discovering she liked guys, too. That realization and the romance itself actually felt secondary to the sister relationship and to Ramona’s own growth as a person. That being said, I adored the romance. I liked that Ramona and Freddie had a past and that they picked up their friendship easily and connected over heartbreak. Watching their relationship progress from friendship into something more was a pleasure and felt very realistic. Going back to my opening of the review, I’d like to point out that not once did the story veer into the territory of Freddie ‘turning Ramona straight’ or ‘fixing’ her. Ramona talks a lot about her feelings - her feelings for Freddie, her uncertainty and confusion, her resistance to put a label on herself once she falls for Freddie - and it was interesting and insightful to be inside her head. One of the things I love most about Ramona was her strength and resilience. She’d been dealt a pretty crappy hand in life, and yet she didn’t feel sorry for herself and didn’t allow that to keep her down. She was forced to grow up quickly and take on a lot of responsibility. She worked hard and stayed in school, all while making sure her dad and sister, Hattie, were taken care of. She was used to making sacrifices for Hattie, but when Hattie got pregnant, Ramona was sure the rest of her life would be dedicated to taking care of her sister and her niece. She could have thrown an endless pity party or become a martyr, but neither of those things happened. There were several scenes that absolutely broke my heart because it was so easy to picture this young woman with this immense sense of obligation, sacrificing so much to take care of her family. Watching her learn that there was more than just work and school and obligation to her family filled me with so much happiness and hope. 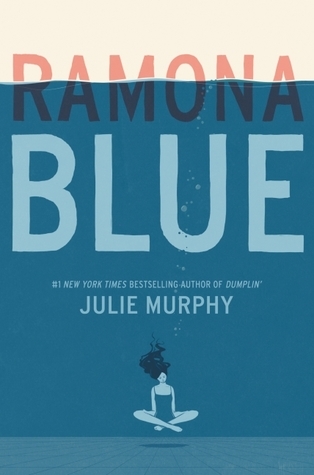 Ramona Blue is a beautiful, touching story. I loved Ramona’s journey of self-discovery. Her loyalty to her dad and sister, as well as her sense of responsibility toward them resonated deeply with me. I connected with her on many levels. This was such a quietly powerful novel that made me run the gamut of emotions. I laughed and cried, and most importantly, fell completely in love with Ramona and her story. I can’t recommend this one enough to fans of contemporary YA. Have you read Ramona Blue? What did you think? If you haven't read it, do you plan to? What was your last 5-star read? I know. The drama made me sad too, considering that this is #OwnVoices. I loved it, and I totally agree with you, a beautiful story of climbing out of the box and discovering oneself. Great review! Thank you, Sam! And exactly, the fact it's #OwnVoices should count for a lot, I think. Everyone's journey is different and they're all equally valid. I'm so glad Julie Murphy wrote this book.